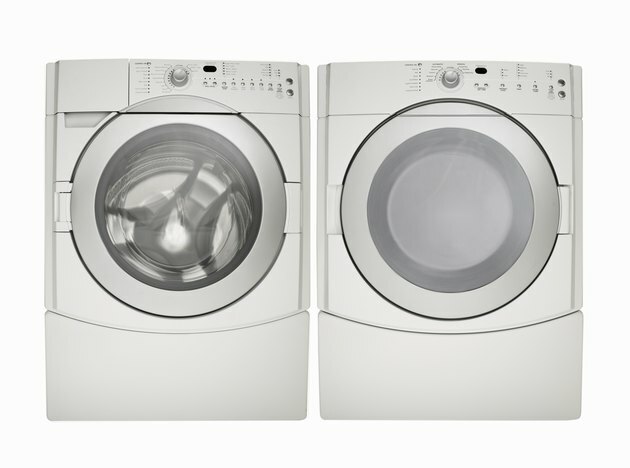 Kenmore dryers are manufactured by other companies like Whirlpool and Maytag before being labeled with Kenmore for sale at Sears Department stores. This means that finding error and fault codes for the dryer is harder than with other brands. Luckily, the "F1" or "E1" error code is a common error across all dryers. It usually requires a small replacement part inside the dryer components. Repair dryer error code F1. Look on the LCD for the flashing error code. Depending on the manufacturer, the error will appear as "F1," "E1," "F-1" or "E-1." All of the LCD lights will flash along with the error code. Hold the "Start" and "Cancel" buttons down for 15 seconds to reset the error code. Remove any clothes from the dryer before proceeding with repairs or diagnosis. The "F1" error means that the dryer's thermistor failed. The dryer is reading the thermistor as "open" and the actual part has shorted out. The thermistor is used to read and control temperatures within the dryer. Without the part, the dryer will not operate. The part is located near the bottom of the dryer and next to the exhaust. Occasionally, an electric glitch or power outage could cause the "F1" error to appear. Test this out by unplugging the dryer, waiting a minute, plugging it back in and doing a short test run. If the error appears again then the thermistor needs replacement. If it does not appear, resume normal dryer operations. Look on the inside lid of your dryer for the model number. Use this model number to contact a local repair shop or Kenmore's customer service website. Purchase the replacement part and follow the instructions to replace the thermistor. The replacement requires removal of multiple sections of the dryer, so you may need the help of outside service to fix the part.